Second Sunrise Over New Mombasa is the fourth and last story in the Halo Graphic Novel. 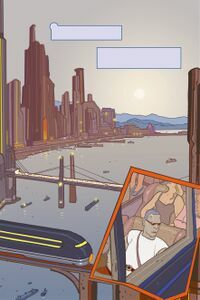 Written by Brett Lewis and illustrated by Jean "Moebius" Giraud, the visual style of the comic is heavily stylized in contrast to the more realistic art in the previous stories. The entire story is a flashback told after the initial Covenant invasion on the city of New Mombasa on October 20, 2552, before the arrival of UNSC reinforcements later in the day. Journalist Benjamin Giraud commutes to New Mombasa on a monorail train. He explains that his job is to edit and manipulate images coming from all over human space, making them more "digestible" for the public. He says his employers pay him well, though he doesn't even know who he is working for: he's actually employed by the Office of Naval Intelligence. He feels both proud and guilty about his work because he is helping to hide the truth about how mankind is losing the war against the Covenant. He describes Mombasa as a cosmopolitan city before the Covenant attack. He remembers when his friends and family thought he was working on a public relations campaign for the Hog; in reality he was being put under pressure by his employers and his job was getting progressively harder due to the UNSC's continuous defeats. He then talks about when the Covenant found Earth: the war always seemed a distant problem to the planet's inhabitants, but soon after it was very present. The train on which he is traveling homebound gets hit by space-falling debris. Giraud then awakes in a hospital when the enemy's ground assault has already begun. During the fight he manages to translate a Sangheili's message saying. "We need to clear this area before we can secure access to the Ark". A Marine officer tells him to get the recording out of the city to UNSC High Command. Arriving at the waterfront he finds the whole city's population trying to leave aboard "anything that floats": he realizes that the recording is too important and that he has to get on one of the remaining boats. In the end he gives the recording to a child who otherwise would have remained on the shore alone; he escorts her to a boat in the hope she is evacuated safely. At the end he is seen in a room filled with screens that show the Covenant overrunning the city, where he says, "What will it matter? This is the first day of the end of the world". The protagonist of Second Sunrise Over New Mombasa remains unnamed in the story. He was identified as Benjamin Giraud when the character was reintroduced in the Hunt the Truth promotional campaign for Halo 5: Guardians. The name is in honor of the comic's illustrator, Jean "Moebius" Giraud, who passed away in 2012. Several background characters depicted in the story are seemingly based on concept art for the Halo games. A number of Sangheili seen in the comic incorporate element from early Halo: Combat Evolved concept, and on page 93, a human soldier shot by an Elite wears armor strikingly similar to an early design for the Mjolnir armor by Shi Kai Wang. A work in progress of a page.